The second heartfelt instalment in this beautifully crafted, sassy new series that will make you laugh and cry. Just when Bluebell thought her crazy family were behaving normally, her parents make an announcement that could turn everything upside down. If only Zoran, their au pair, would come back to live with them. Unfortunately he’s too busy teaching guitar to his new protégée, Zachary Smith. Blue is jealous at first, until Zach starts helping her little sister with a project and becomes a regular visitor at the Gadsby house. 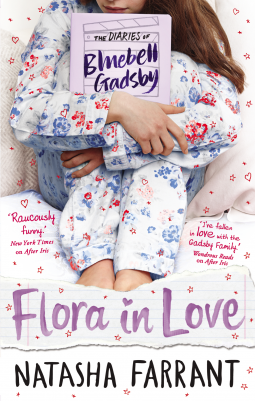 I read all of Flora in Love in one greedy gulp and I loved every second of it. This series is sweet, funny, heart-warming and just plain wonderful; I’d be happy to read instalments of this series for a long time to come. The whole of the Gadsby family is mad, and completely lovable. Each character is so unique, distinct and well-rounded and I connected with each of them. The chaos and life in that house is infectious and I would kill to have grown up in a house like that. In the first book, the Gadsby’s took Zoran under their wing, and in Flora in Love it’s the turn of Zach – one of Zoran’s music students. I love the way that they take someone lonely and fragile and immerse them in their fierce, chaotic love until they’re a little more whole. It gives me the warm fuzzies to see the arc of the character that Blue and the gang take in. As well as the Gadsby children, there are the Gadsby parents. It’s still quite refreshing to get fully alive and present parents in teen and children’s fiction and I really appreciated having them there. As well as the role they play as parents, they’re brilliant characters in their own right with quirks and funny lines, outbursts and dramatic bomb-dropping. And boy did they drop a bomb on the kids! That announcement is going to add a really interesting dynamic to the next book and I can’t wait to see how Blue, Flora, Jas and Twig deal with their lives turned upside down. I adore this series, and if you haven’t read After Iris and Flora in Love you’re seriously missing out. Get on it! Thanks to Faber and NetGalley for the review copy. Leave a message, I'd love to hear from you!